Is India's nuclear establishment prepared to deal with a Fukushima-type crisis? "There is no nuclear accident or incident in Japan 's Fukushima plants. It is a well planned emergency preparedness programme." S.K. Jain, Chairman, Nuclear Power Corporation of India Ltd (NPCIL) "It was purely a chemical reaction and not a nuclear emergency." Srikumar Banerjee, Chairman, Atomic Energy Commission on March 14, three days after an earthquake and tsunami incapacitated cooling facilities at the Fukushima Daiichi nuclear plant in Japan and prompted authorities to declare a "nuclear emergency", India's top nuclear officials still claimed the plant operator was only carrying out "a well planned emergency preparedness programme". Over the next few days, as the threat of a nuclear catastrophe became real, these same officials rushed to assure the public that a Fukushima-type disaster could never happen in India. Indian reactors are built to withstand quakes, they use different technology, and India follows all safety norms, they said. But independent experts claim the Department of Atomic Energy, or DAE, is opaque, secret and unaccountable. "The Indian nuclear establishment writes itself validation of its own totally fault-free, risk-free performance," says V.V. Desai, a former chief economist at the Asian Development Bank who has been involved with the power sector. Agrees A. Gopalakrishnan, former chairman of the Atomic Energy Regulatory Board, or AERB: "Our nuclear plants need a high-level in-depth review by an independent expert group." Others say radiation data from nuclear plants should be in the public domain, and the AERB must involve independent experts to calculate risks and monitor performance. Officials cite physical factors to claim that India's plants cannot suffer a Japan-type disaster. All but one of India's nuclear plants are in the relatively safe seismic zone 3 (Narora in Uttar Pradesh is in zone 4). In contrast, almost all of Japan falls in zone 5, prone to the most severe earthquakes. 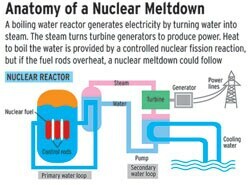 Again, most Indian plants have heavy water reactors while the 40-year-old Fukushima plant had boiling water technology. "It is easier to manage heavy water reactors," says P. Ravindra Reddy, Chairman of MTAR Technologies, supplier of fuel handling systems and other corerelated components to NPCIL. After the Japan crisis, NPCIL said India's power plants have weathered natural disasters well. During the 2004 tsunami, the Madras Atomic Power Station went through proper shutdown procedures. The Kakrapar Atomic Power Station in Gujarat functioned through the 2001 earthquake. But a risk-free past is no guarantee of a similar future. Already, there are protests over NPCIL's deal with France's Areva to set up a project at Jaitapur, using a yet-to-be-operational technology. The Japan earthquake is the worst ever in a region that reports more than 1,000 quakes a year. A DAE official admitted the department does not have "a readymade answer" to deal with such a crisis. The lessons of Japan are not limited to location, power supplies or safety standards. The Fukushima plant building did not suffer any damage in the quake and went through the shutdown procedure. Failure of backup power and water supplies led to the crisis. India's response so far, then, has been to set up a panel to look into backup power and cooling water sources at all nuclear plants. Japan's prompt evacuation was also praiseworthy. On the other hand, AERB's disaster preparedness is mainly on paper and the drills conducted are once in a while and half-hearted, says Gopalakrishnan. Agrees G. Balachandran of the Institute for Defence Studies and Analyses: "It is important to note the speed with which Japan acted." There could be lessons for India in this. After all, the greatest disaster in the country's history, the gas leak at Bhopal, was not caused by an earthquake or a tsunami.